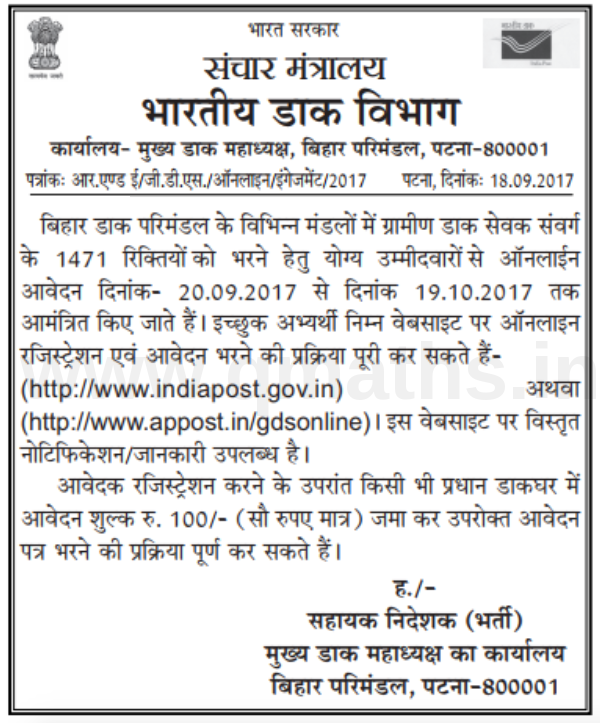 Bihar Post Office Recruitment 2017 GDS Posts – Apply Online for 1471 Gramin Dak Sevak Vacancies in Bihar Postal Circle: Bihar Post Office GDS Vacancy announced. Department of Posts, Bihar Postal Circle has issued an employment notification for holding an aptitude test for the recruitment of GDS posts. Online Applications are invited from Indian nationals for filling up 1471 Gramin Dak Sevak vacancies in Postal & Railway Mail Service division in Bihar Postal Circle. Division Wise Vacancies: It will be updated shortly. Age Limit: Candidates age minimum age should be 18 and maximum age limit is 40 years as on 19--10-2017. Age relaxation is applicable as per the Govt. rules. Application fee should be paid in a Post Office in Bihar Postal Circle through e- payment. How to Apply: All those candidates who wish to apply for GDS Vacancies posts in Bihar Postal Circle, they are required to apply through online on its website at http://www.appost.in/gdsonline/ on or before 19th October 2017. More Details: If you are looking for detailed information about Bihar Postal Circle GDS Recruitment for Gramin Dak Sevak Vacancies posts regarding age limitations, educational qualification, selection process, pay scale, how to apply and application form. Bihar Post Office GDS Recruitment Advertisement [Download].